Unlike the rest of us, Disney will be looking back on 2016 with fond memories. Most if not all of its major theatrical releases, from in-house productions like Zootropolis and The Jungle Book, to purchased properties like Captain America: Civil War, Finding Dory and Doctor Strange, have all not only debuted to stellar reviews, but have also collectively made over $3 billion at the worldwide box office… and that’s even before the year has officially closed out. 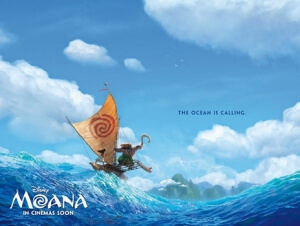 One of their last remaining releases of the year is Moana, the 56th official Disney animated film, and it is destined to continue their hot streak both at the box office and with audiences, because it is a fun adventure movie that hits all the right notes for almost everyone. It tells the tale of Moana (newcomer Auli’i Cravalho), the young daughter of a chief tribesman (Temuera Morrison) in a small island community within the South Pacific. From an early age, she has had a fascination with the vast ocean that surrounds her home, as well as the legend of a demi-god named Maui (Dwayne Johnson) who stole the heart of the ancient goddess Te Fiti, leading to a curse that has spread across the sea. When her island starts to show signs of this curse, Moana takes it upon herself to venture out into the harsh and forbidden waves to find Maui and restore the heart so her tribe can be saved. The only problem is, Maui’s a bit of an egotist, and he’s not so fond of the idea that a young mortal woman is recruiting him for a job he has no interest in actually doing. So, both must learn to get along before the day can be saved, and on their way they encounter several dangerous creatures and obstacles, while eventually learning more about themselves than they would have previously thought. Moana marks the CG debut of legendary in-house animators Ron Clements and John Musker, who in the past were behind some of Disney’s most popular films like The Little Mermaid, Aladdin, Hercules and The Princess and the Frog among others. Though the days of traditional hand-drawn animation are sadly all but over now for Disney in the wake of computers, its spirit is definitely present and correct in this energetic and extremely colourful romp that Clements and Musker try their hardest to resemble something they themselves would have made back when all they had were the hands of several animators, as opposed to several graphics artists as is the norm in this day and age. They bring warmth, wonder and a whole lot of excitement to this film, from the scenes of water-based action – including a showdown with a horde of pirate coconuts (it’s much cooler than it sounds) – to the vibrant and gleeful musical score that presides over the majority of the film, Hamilton’s Lin-Manuel Miranda co-writes a number of the original songs here, and while they may not be as immediately catchy as the tracks from Frozen, they are still tunes you’ll eventually be humming to yourself for some time after, not least because of Miranda’s wily lyrical prowess mixed with the same type of hip-hop stylings that made Hamilton the theatrical powerhouse it is today. Clements and Musker have also brought to the screen a new heroine that defies traditional expectations for a female lead, but in a way that feels fresh and thankfully progressive. Her character is not saddled with doubts about taking on a position of royalty in her community, nor is she given a romantic interest to pine over from afar; she is shown very early on to be a thoughtful and patient leader, even though her love for the ocean that her father forbids her from venturing into tends to overcloud her focus. Once she does set out on her quest (though it does take a little bit of time before that happens, time which it in fairness dedicates to character development over anything else), the stakes suddenly become higher because by that point, you’re really invested in this smart and likable person, and don’t really want to see her succumb to an unexpected end (even though this is Disney, and of course they would never let anything like that happen). Throughout the film, she becomes a protagonist who you admire for her bravery, intellect and humanising flaws, something that is further drawn upon by the introduction of Dwayne Johnson’s Maui into the frame, who goes through a nice character arc of his own which is boosted by a reliable chemistry with his new partner-in-crime. Cravalho, too, is an extraordinary find; she more than holds her own in scenes opposite the always-charismatic Johnson, and she elevates the character into someone that even the most cold-hearted person would warm towards, not to mention a cracking singing voice that should launch a steady career for the native Hawaiian. At its heart, the film is a solid adventure, one that has an intriguing backstory and exhilarating characters that partake in it, filled with great amounts of comedy, drama and music to leave everyone with a satisfactory smile on their faces. Between this and Zootropolis, however, the latter had a bit more weight to it, tackling heavy issues like prejudice and discrimination that made it more than just another Disney animated film with talking animals, while this one is just more of a straightforward musical adventure. Conceptually, Zootropolis just has the edge, but that should not dissuade anyone from Moana’s gleeful charm, as it is a gloriously animated and delightfully told film that should make audiences – as well as Disney, for the umpteenth time this year – sing their hearts out with joy. Moana is a highly entertaining musical adventure family film that directors Ron Clements and John Musker bring to life via colourful animation, crafty musical numbers, and an admirable lead character for everyone to call a new favourite.